On 21 March 2017 Director of the UNESCO Cluster Office in Almaty visited and delivered a welcoming speech at the Opening ceremony of the Central Asian Forum "Art Education for Dialogue and Understanding between Cultures", which takes place on 21-22 March 2017 in Almaty, Kazakhstan. The Observatories for Art Education of the Asia-Pacific region countries, as well as the UNESCO experts, scientists and public figures from Central Asian countries, Australia, Singapore, South Korea and other countries were invited to participate in the event. The purpose of the forum is to determine the place of art education in the preservation and development of cultural traditions. The forum is also devoted to discuss the role of art education in the schools’ system of different countries and the influence of art education on the formation of the kids’ personality and mentality. During the work of Forum participants will share their experience in development of the creative abilities of children and youth and will exchange with their technologies, materials and experience. 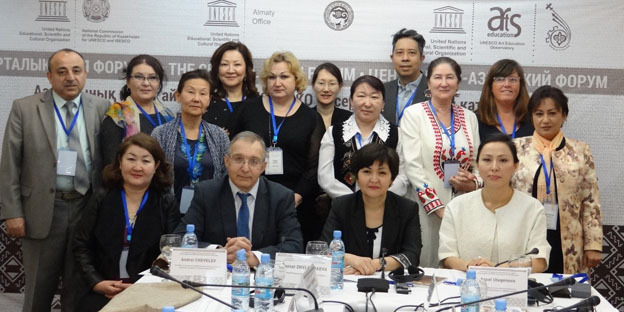 The Forum organized by the UNESCO Observatory for Intercultural and Creative Education in Central Asia under the School of Fine arts and technical design named after A. Kasteev – UNESCO Club, with the support from the National Commission of the Republic of Kazakhstan for UNESCO and ISESCO and UNESCO Almaty Cluster Office for Kazakhstan, Kyrgyzstan, Uzbekistan and Tajikistan. It should be noted that the work carried out by the Observatories of the Asia-Pacific region is relevant and interesting for institutions involved in the promotion of art education in the framework of UNESCO's programmes.